Shuffle Master is one of the world’s leading companies dealing with the development, manufacturing and marketing of technology-based products for the gaming industry. Shuffle Master directs its business in two different lanes: Utility Products and Entertainment Products. Utility products include card shufflers, chip sorters and table system modules. Entertainment products incorporate live proprietary table games, multi-player game platforms and wireless gaming solutions, among others. Shuffle Master’s dream-turned-reality story began in 1982 when truck driver, John Breeding imagined a device that would put an end to the frustration of many Atlantic City casinos that were fed up with card counters on their premises. Breeding’s device would shuffle cards between games and thus prevent card counting. It took almost a decade of determination and ambition before Breeding’s dream became a reality and the first shufflers (BG-1, 2 and 3) were licensed in Nevada. As the years progressed, Shuffle Master continued to make giant strides in the gaming industry. It developed the Let it Ride poker-style game and incorporated it into its Entertainment Products division, thus increasing the demand for shufflers from its Utility Product line. Today’s Shuffle Master games are top-of-the-range and technologically advanced. The 21-45 year-old age bracket – a group that is no longer satisfied with traditional interactive games such as slots, especially seeks them out. Due to the amazing popularity of Shuffle Master games, more and more casinos add this company’s products to their selection of casino games every year. Of the 6500 specialty games available in the gaming industry today, Shuffle Master Entertainment Products can proudly claim three out of the five top titles as its own. The future of Shuffle Master looks extremely promising, if its financial records are anything to go by. Its financial results for the 2nd quarter of 2006 showed that Shuffle Master’s revenue increased by 60% to $43,300,000. For the fifth year running, Shuffle Master made the Fortune Small Business 100 list (64th place) and is the only company to have made this list for five consecutive years. Besides for the amazing products created by its Utility Division, Shuffle Master’s Entertainment Products are first class. Much thought and originality goes into planning games put out by Shuffle Master and the results speak for themselves. Shuffle Master’s games are too numerous to mention on an individual basis, but we bring you an example of some of their top games and machines. Shuffle Master’s Three-Card Poker is fast-paced and extremely exciting, making it one of the most popular table games in the industry. In fact, over 1200 of these games are in action in the gaming market. 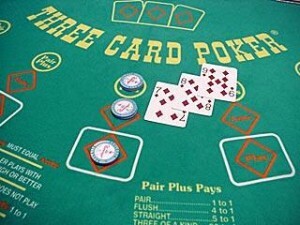 The beauty of Three-Card Poker is that there are three ways to play (bet against the dealer, bet against the player’s own three-card hand or bet against both) but four ways to win! Much of the fun from Three-Card Poker comes from the simplicity of the game and players love the comradeship that develops around these tables. Because Casino War is so easy to understand and appeals to such a broad range of players, it has acquired quite a name for itself in casinos across the world. Based on the popular card game, “War”, Shuffle Master’s Casino War allows players to place a bet and win even money if their card’s value is higher than the dealer’s. If the value is the same as the dealer’s, the two sides are at war. Once at war, the player can either quit play (and surrender half his original wager) or match the original wager and take another card. Casino War is the classic blend of good old-fashioned fun and exciting fast-paced casino gambling. Table Master was developed by Shuffle Master to allow casinos to double the number of hands played per hour in the casino, while also providing players with top-of-the-range technology in gambling locations. Table Master was developed with the word ‘flexibility’ in mind. It allows casinos to customize the games played and the table wager amounts to suit the gambling needs of specific locations and players. Video dealers entice players to try a selection of popular table games, including Blackjack, Three-Card Poker, Dragon Bonus Baccarat and Royal Bonus 21 Blackjack. By combining the latest technology with the fun and excitement of live playing, Shuffle Master has created a leader in the field of electronic table games. Shuffle Master’s Vegas Star is a multi-terminal gaming machine that allows players to sit at individual stations to play the latest popular games. Casinos can customize games and wager limits to suit the requirements of their gambling public. 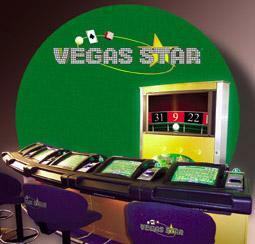 Vegas Star features touch screens and an animated video presentation of table activity, making for exciting but comfortable playing conditions. Gamblers can choose from a variety of popular casino games, including Baccarat, Roulette, Sic Bo and Blackjack. 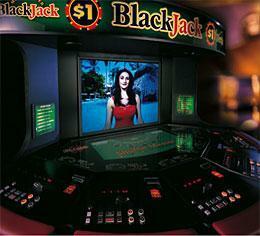 Look out for Vegas Star gaming machines with the Mystery Progressive Jackpot system for added fun and excitement. Shuffle Master continues to grow within the gaming industry – both online and at land-based gambling locations. Its electronic table games are especially popular at racinos or in video lottery markets where live table gambling might still not be legally permitted. In addition, Shuffle Master hosts live poker championships across the United States, thus directly influencing the growing popularity of this game in the world. At the recent Three Card Poker National Championships, poker players competed against each other for a whopping one million dollars in prize money and the chance to feature in a reality television program about poker. On an international scale, Shuffle Master has its presence deeply felt in the world’s gaming markets, with its products marketed and distributed all over the globe. Shuffle Master has offices in the Americas, Europe and Australia. The company also continues to expand internationally. In February of this year, Shuffle Master acquired the Australian-based Stargames Ltd. In April 2006, Shuffle Master and Stargames aligned with Melco and Elixir to distribute gaming technologies throughout Asia. This move places Shuffle Master securely inside the Pacific Rim – an area that has yet to reach its full potential in the gaming world. At present, Shuffle Master employs over 350 full-time employees and others through its subsidiary companies. As the gaming industry continues to grow, Shuffle Master shows every sign of staying in the race to provide us with flawless gaming solutions. The company is capable of ensuring secure, efficient and convenient game performance – both through its Utility and Entertainment Products. As technology takes on more and more exciting features with each passing year, Shuffle Master will continue to adapt its games and products to bring gamblers the last word in gambling entertainment.